We woke up really early at 4am because we were still jetlagged and not used to London time. We had our breakfast the moment it was ready and were out of the hotel just after sunrise at 7.30am! Super early considering I'm totally not a morning person! Left our hotel bright and early this Sunday morning while everyone else is still asleep! We headed to Hammersmith Station to get our Oyster card for travelling on the public transport system in London. It's very easy to buy Oyster cards from the machines at the stations. 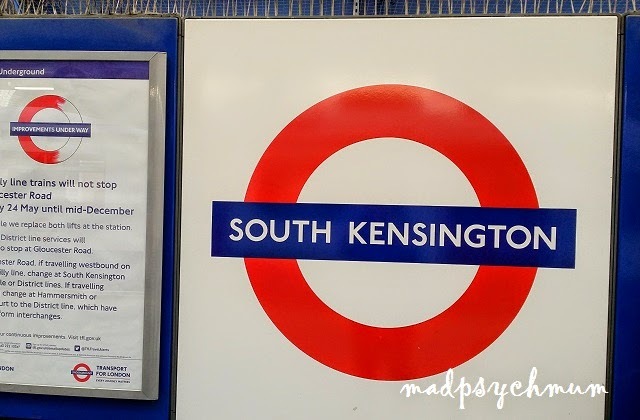 Please read my tips on transport in London for more information. 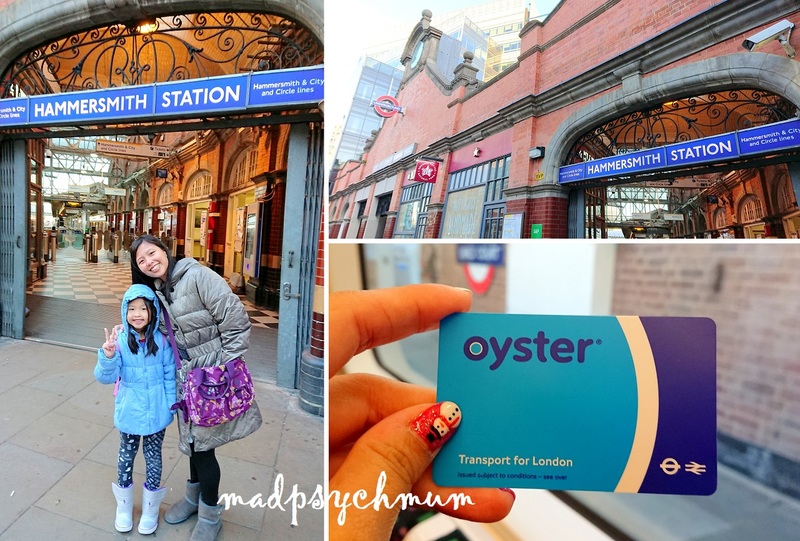 We got our Oyster card from Hammersmith Station and were all ready to explore London! It was a lot more comfortable travelling by trains during Winter as compared to Summer as there is no air-conditioning in the trains! It was such a torture during Summer but so much more bearable during winter! However, do note that data connectivity is terrible underground so if you need to Google for any information, you'd need to do it BEFORE entering the station. We took the District Line (green) directly to Westminster Station, where we disembarked to see the Big Ben, London Eye, River Thames and Westminster Abbey. 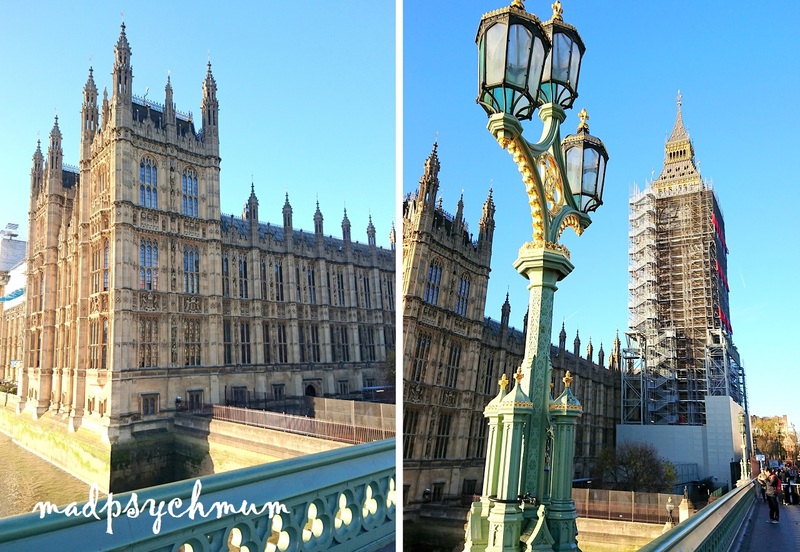 Even though the mum and I had been here previously with my then 6-month old baby boy in 2014, we're visiting again because the Big Ben is one of my favourite landmarks in the world! We had to contend with taking pictures with the other famous sights instead. Right: Statues of famous people such as Winston Churchill stand tall nearby. 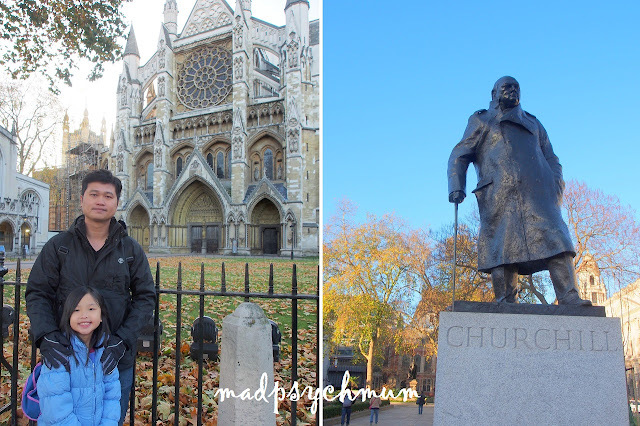 From Westminster Abbey, we walked along Whitehall Road to Trafalgar Square. We didn't have time to visit the National Gallery London when the mum and I visited Trafalgar Square in 2014, so I made it a priority to visit for this trip since it's FREE! 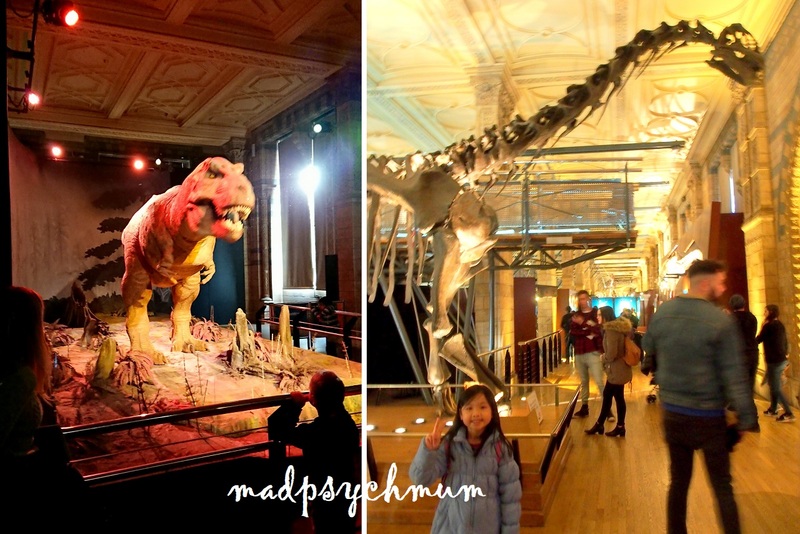 Gotta love the UK for making their museums free for all visitors! 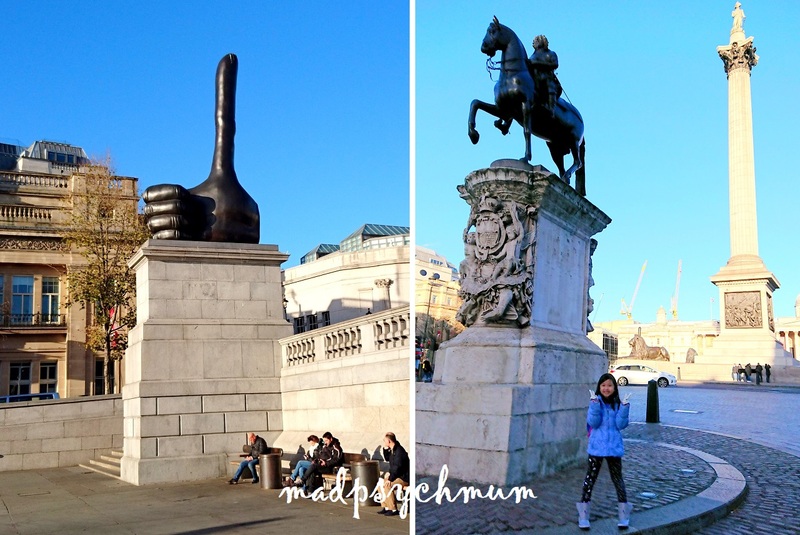 We proceded to our next stop by walking to the nearest station, Charing Cross Station. Here, we took the Bakerloo Line (brown) to Elephant & Castle Station and transferred to the Northern Line (black) to London Bridge Station. In any case, we found a nice Italian eatery, Cafe Brood, that was one of the few restaurants that were open and decided to grab our lunch there. We loved the chicken kebab in the Box 2 set so much that we got another box with just the chicken! So yummy!! 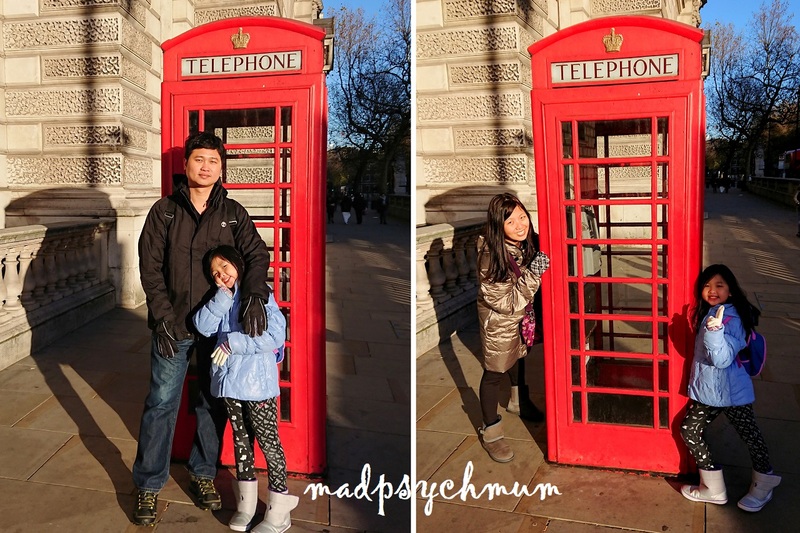 After a fulfilling lunch, albeit in the freezing cold, we walked to London Bridge, which was just a short 2-3 minutes walk from Borough Market. As mentioned before, London Bridge has been rebuilt and modernised because the old one has fallen down; remember the famous childhood song "London Bridge is falling down..."? The bridge that we are most acquainted with is actually Tower Bridge, just a short 10-minute walk from London Bridge. Do also check out The Shard, which is also in the area and is the tallest building in London. After we were done taking photos, we headed back to London Bridge Station to take the Jubilee Line (grey) to Westminster Station and transfer to the Circle Line (yellow) or District Line (green) to South Kensington Station. 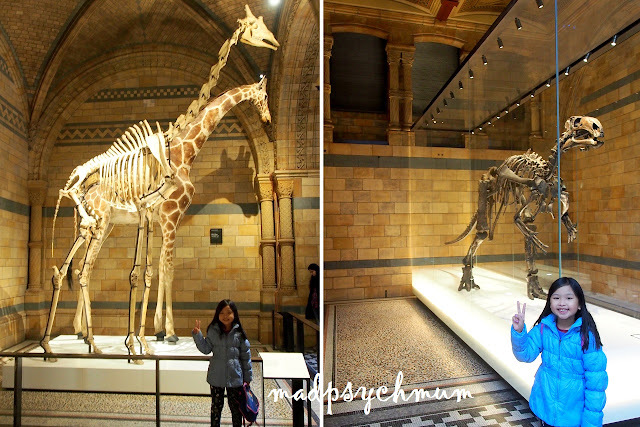 We were here to visit the Natural History Museum, just 3-minute walk from South Kensington Station. I love the Natural History Museum for its architecture and exhibits and best of all, it's FREE! 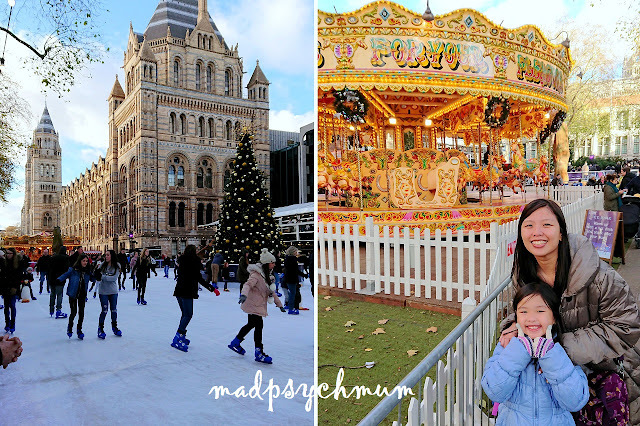 Ice skating and carnival activities happening just outside the Natural History Museum during the winter! 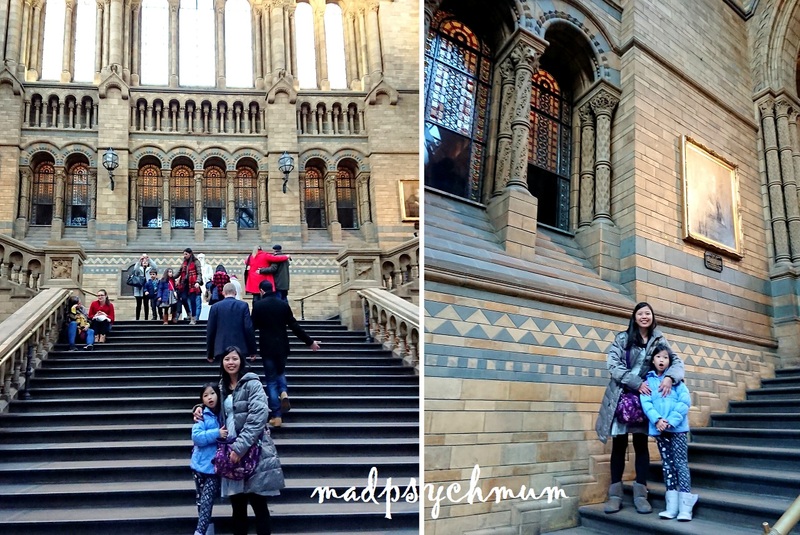 When we entered the Natural History Museum, I was expecting to see a huge skeleton of dinosaur bones hanging in the middle of the main hall just as we did the last time that we were here. It turns out that the dinosaurs have their very own exhibit! That was where we found good ole Brachiosaurus. Right: The head of the Brachiosaurus is found! Poor thing looks so suffocated in such a tiny gallery! Haha! 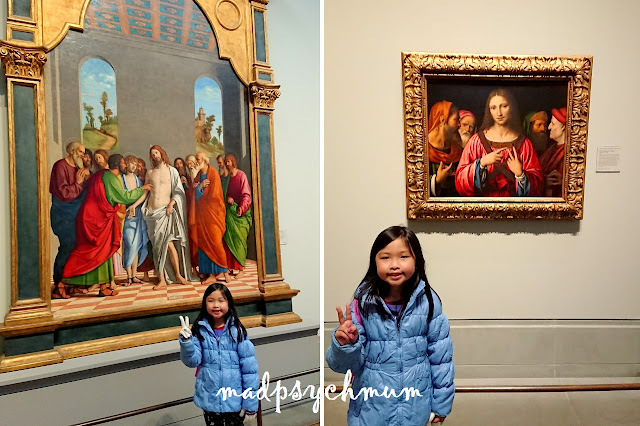 We left after we explored the rest of the museum, which had other interesting exhibits. We returned back to our hotel after our visit but if you've got more time, do check out the Victoria Albert Museum and Harrods just down the road (read more about our experiences here)! They're so awesome too!